DJI Phantom 4 drones actually constitute more of a series of different kits, rather than a single model. They’re all based on a single body that’s proven extremely easy for beginners to fly, without cutting down on any of the advanced features that make it the choice of many serious drone racers. With a maximum control distance of 3.1 miles, and a pretty long battery life, we felt that the Phantom 4 deserved a second look. So here it is a DJI Phantom 4 review consulting the product's presentation, anecdotal evidence, and hardware specifications to give you the fairest look possible. The camera technology DJI used to build the eyes on this drone is perhaps the most impressive aspect of its design. Advanced polycarbonate lenses provide users with an impressive 94° FOV when shooting photographs with the Phantom 4. All photographs get sent right to microSDHC and microSDXC cards attached to the DJI Phantom quadcopter drone camera camera. The system supports both the FAT32 and exFAT file systems, which means you can replay memories of your flight with pretty much any mobile device or PC on the market. Phantom 4 quadcopters are best to fly outside. We feel it necessary to state this in our DJI Phantom 4 review: since they can fly up to 44.7 mph in sports mode, these drones are much too powerful for comfortable indoor flight. Outside they beat most of the competition with a gimbal-stabilized -90° to +30° pitch system that keeps them upright in even fairly windy conditions. If you are wondering how long can a Phantom quadcopter fly, know that Phantom 4 flight time is of maximum 30 minutes. While Phantom 4 drones could probably fly even higher without suffering any serious damage, DJI limited the ceiling to 400 feet in order to prevent overambitious pilots from taking their aircraft to ridiculous heights. You can usually get the craft to descend at slightly less than 9 mph once it reaches the apex, but DJI Phantom 4 can fly much faster in the upwards direction. In testing the drone for the DJI Phantom 4 review, we found that DJI makes one standard type of remote control that comes with all of their drones, so you’ll find it easy to use if you’ve ever tried one of their other units. If you haven’t, then it’s still pretty intuitive and features a two-stick configuration that’s about as responsive as the controllers included with most video game consoles. The remote offers a mounting bracket for a mobile device. Keep in mind that these accessories change depending on the DJI Phantom 4 kit you choose and when you purchase it. Like most DJI drones, the Phantom 4 is a joy to fly. It can detect obstacles as close as two feet away, and as far as nearly 50 without any problem. The GPS and GLONASS satellite navigation systems make it extremely simple to find your way around. And they’re great when it comes time to sync a mobile device to your drone. Since it supports so many types of microSD cards, you won’t have any problems sharing video or photos from your flights either. You can record your flight as MP4, MOV or MPEG data without any real reduction in quality. We have found, when testing for this DJI Phantom 4 review, that the biggest drawback to the Phantom 4 is the wide variety of different configurations and kits available. While choice is always a good thing when it comes to buying any tech product, some users have said that they thought they were getting one product when they were actually getting another. The price is also an issue since many DJI kits can be quite expensive. You’ll have to register your drone in some jurisdictions, which can also be a problem for many users. Users who want to put their drones to serious work especially like the Phantom 4, including one who used it to monitor cattle on a ranch. He was happy that the drone would easily avoid crashes automatically. While the vast majority of users are extremely pleased with the DJI Phantom 4, a second user complained that he still needed to track down a few parts even after ordering a so-called complete kit. This reflects the concerns of many other users. A third user, however, said that he was originally skeptical, but soon found that the kit had everything necessary. They’ve flown their Phantom 4 drone for over 26,000 feet so far. You might have some initial difficulties picking out the exact parts you want for your Phantom 4 drone. But you’ll love to fly it once you do order one. It’s very easy to fly even if you’re a beginner. However, DJI Phantom 4 doesn’t shy away from offering users advanced options that make it a serious choice should you actually want to use one in a productive work environment. Thank you for reading our DJI Phantom 4 review. If you have any experience with the Phantom 4 or want to ask us more about it, then we’d love to hear from you. 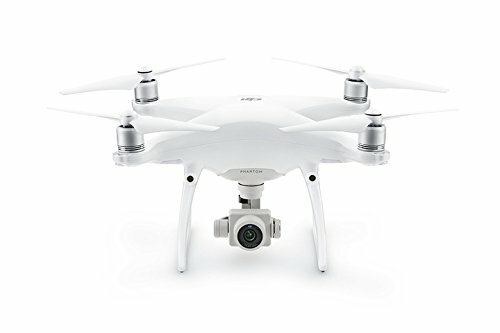 If you think that the Phantom 4 is too much for you, here is our DJI Phantom 3 review for pro pilots and hobby pilots as well.